Simple and beautiful network performance, quality and usage monitoring. 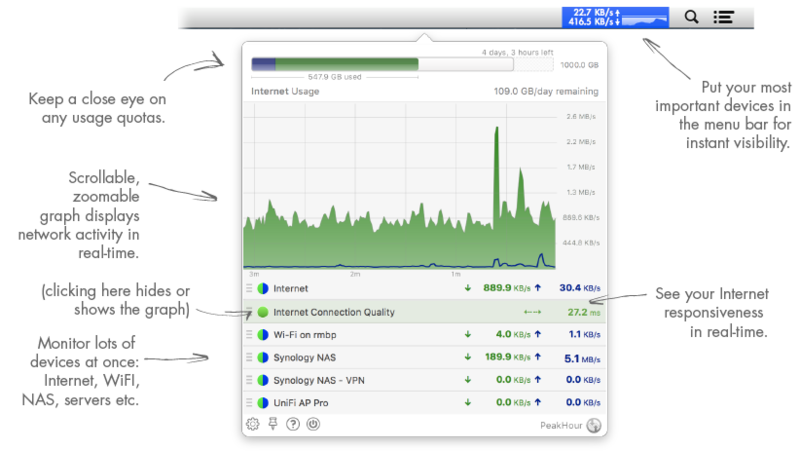 network performance monitoring for your Mac. Monitor your Internet performance, usage, connection quality and lots more, right from your menu bar. First Time Setup wizard guides you through setup, step-by-step: automatically detect compatible Internet routers, enable Usage Monitoring, search for other compatible devices, setup Connection Quality monitoring and enable PeakHour Remote all in one go! Monitor your Internet throughput and performance. Know you're getting the speeds your ISP promises. Watch performance and usage of compatible network devices in real-time: routers, WiFi, Macs, PCs, NAS, servers and more. Keep an eye on your usage and get alerts when you're close to your quota. 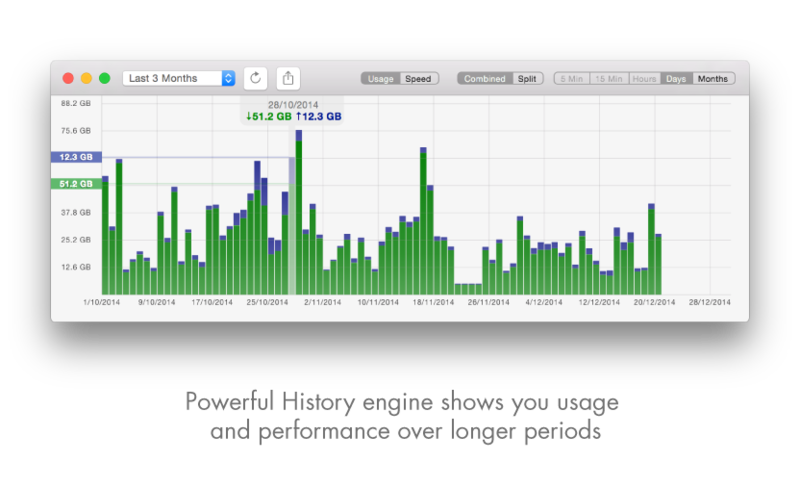 A powerful History view lets you see usage and performance over days, weeks or months. 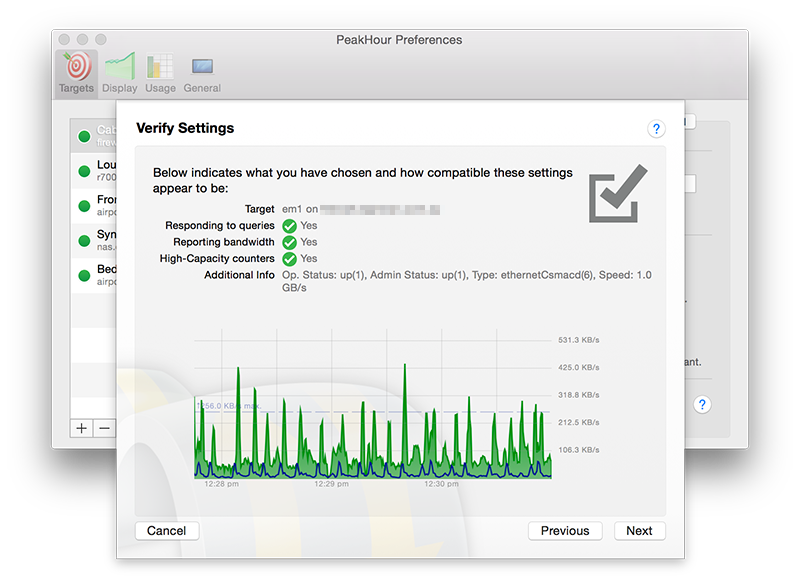 You don't need to be at your Mac to keep an eye on PeakHour. PeakHour Remote lets you view PeakHour from any modern browser. 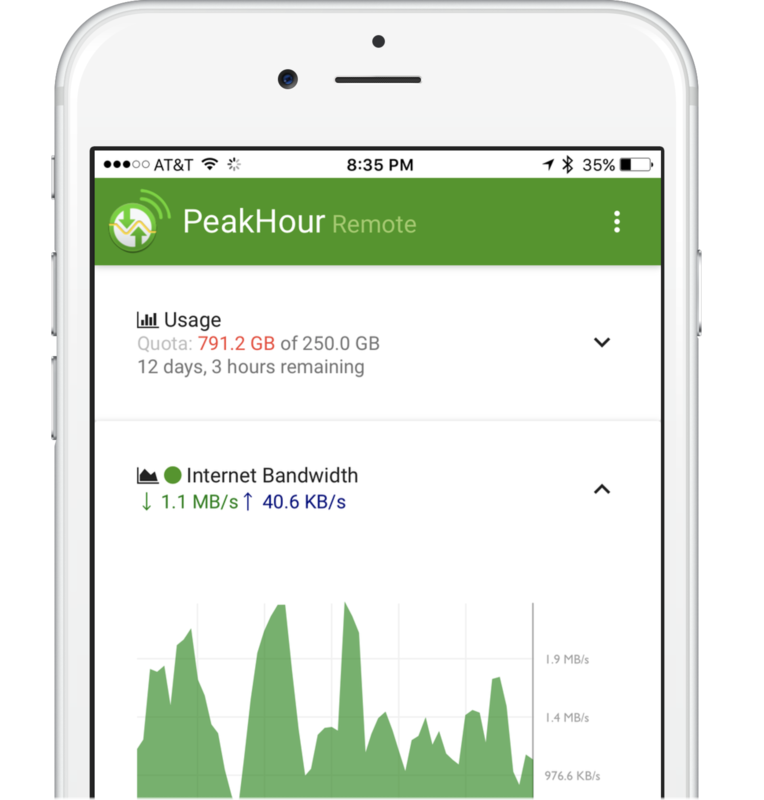 Add PeakHour Remote to your phone or tablet's home screen and you're one tap away! Poor Internet performance can negatively impact every aspect of what we do online: slow site loading, unresponsive web pages, constantly buffering video streams. PeakHour lets you monitor the quality of your Internet connection and other sites on the Internet such as NetFlix and Amazon Video to keep an eye on how well your connection is performing. With the all-new Dark Mode, PeakHour automatically adjusts itself to suit your macOS settings. Not only does it look great, Dark Mode reduces glare and eye-strain during the nocturnal hours. ... and lots, lots more. Built on Apple's latest version of AppKit, PeakHour 4 supports many of the latest features introduced in macOS Sierra. Periodically export your usage to a file, allowing for offline recording or analysis. Alerts can notify you when you exceed your usage thresholds. Monitor other Macs on your network easily with PeakHour Enabler's iCloud-powered automatic activation. 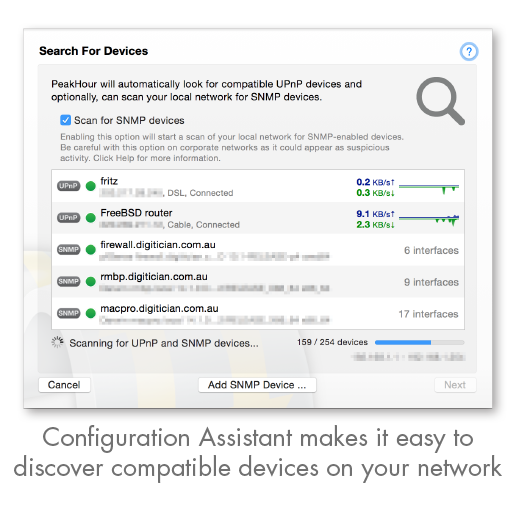 The only bandwidth monitoring tool to support both UPnP and SNMP, making it more likely to work with your devices. 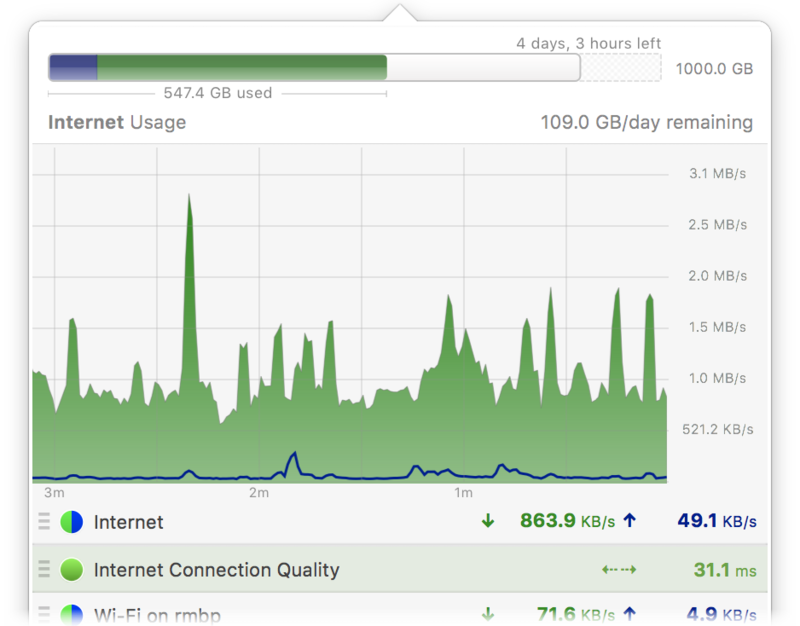 Powerful, flexible usage monitoring helps you track your Internet usage and stay within your limit. Monitor as many compatibile devices as you like, each one with its own specific look. Measure performance where it counts - from the device itself. Monitor your own usage. Know your Internet Provider is delivering the speeds you're paying for. Support for SNMPv1/2c/3 and High Capacity (64bit) counters. Will PeakHour work with my devices? Not all device are created equal. Whilst we do our best to make sure PeakHour works with many different makes and models, the best test is to try it for youself. To find out, grab the free 10 day trial. The trial version is fully functional so you can try all of PeakHour's features with all of your devices. Detailed documentation on features and setting, including a section dedicated to Getting Started. A list of the most commonly asked questions and solutions. Also check out our comprehensive Wiki that describes many terms you may not be familiar with. If you purchased direct from us (via Paddle) and you've lost your license, use this button to recover it. Still stuck? Drop us an email with your question or issue. We're always happy to help. Thank you for trying PeakHour 4! Your download will begin in a few seconds (if not, click here). While you're waiting, you might want to take a look at the Getting Started guide to familiarise yourself with first-time setup. Stay up-to-date by joining our newsletter (no spam, we promise). Thank you for downloading PeakHour 4! We're now sending you PeakHour 4 which you are welcome to try for 10 days. If you decide to upgrade, make sure you have the latest PeakHour 3 installed and activated. If you need your PeakHour 3 license key, you can recover your license. You will see the upgrade offer after launching PeakHour 4. For more information or if you run into any problems, see how to upgrade from PeakHour 3 for more information. While you wait, stay up-to-date by joining our newsletter. Enter your details below to recover your license. The email address is the one you used to purchase. Note: If you purchased from the Mac Appstore, visit the Purchases tab in the App Store to download your licensed version.